Club Penguin Cheats by Mimo777 Club Penguin Cheats by Mimo777: Club Penguin April Fools Igloo Decorating Contest! 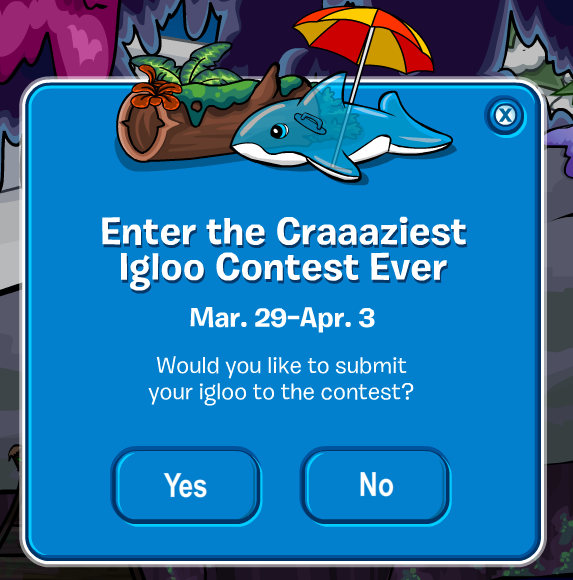 Club Penguin April Fools Igloo Decorating Contest! Club Penguin has a new Igloo Decorating Contest for the April Fools Party. Once you get your iggy all craaazy awesome and what not, click the button in the bottom right. Dood, I so gotta enter this contest! If anyone knows wacky, it's me! Did you submit your iggy yet? Remember in the 2009 Party there was boxes for you igloo? Did you get any Mimo? I tried to enter but it won't work. That happened for me last time there was a contest too. Oh well, the party is good.